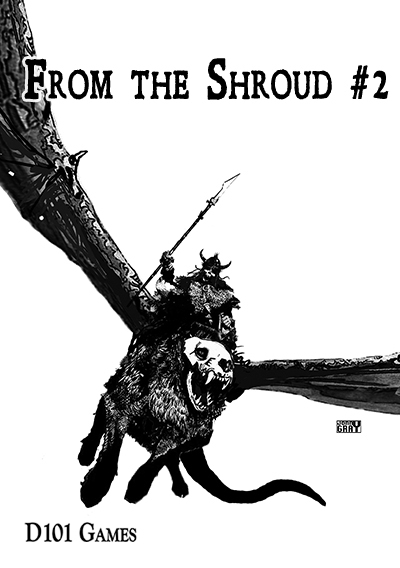 The From the Shroud #2 Kickstarter is nearly over, with less than 48 hours to go. 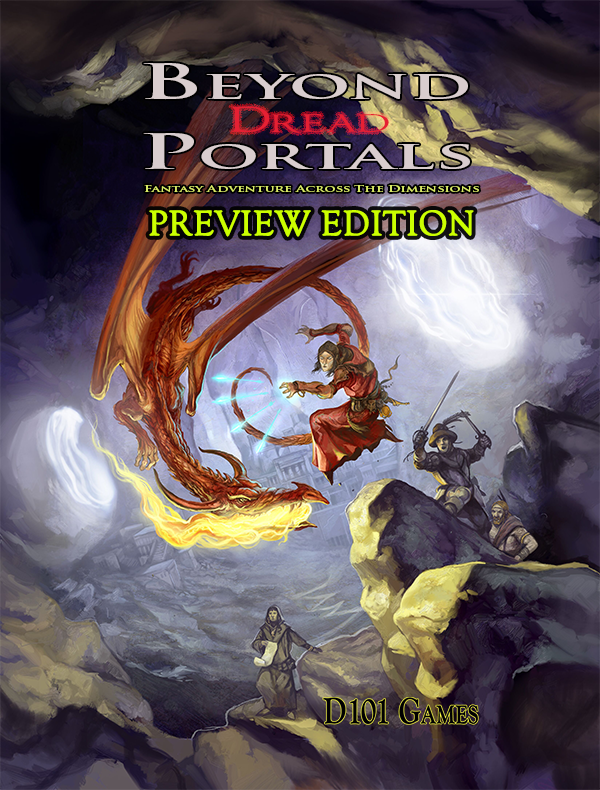 Four stretch goals funded which include two additional a5 books (Crypts & Things Black Hacked and The Lost Lands of Grungamesh) and now we are funding a preview version of Paul Mitchener’s Beyond Dread Portals; an A5 version with adventure playable up to 5th Level. This is your chance for as low as £3 (the pdf level) to get a playable sneak peek of this game of fantastic multidimensional exploration. Quick update about the From the Shroud Issue 2 ZineQuest Kickstarter. 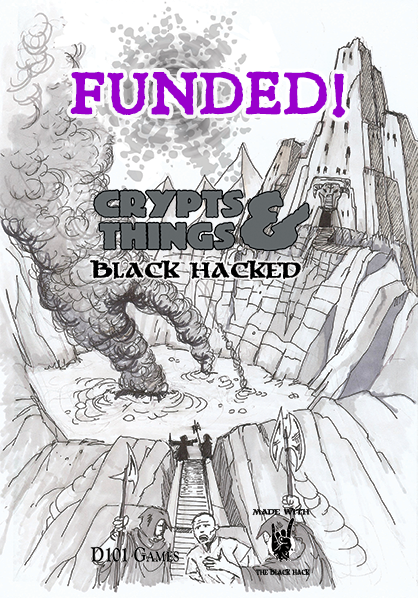 So I added a zine sized (A5 approx 40-50 page) version of Crypts and Things powered by The Black Hack, called Crypts and Things Black Hacked, and guess what? That’s right, so all backers of the campaign (whose buy-in is as low as £3/$4 for the PDF) get a copy of C&T Black Hacked as well as the From the Shroud #2. That’s two for the price of one!!! And soon it’s going to be three for the price of one, as we are now funding a stretch goal which gives a new Swords and Sorcery setting in A5 Zine Format for C&T, C&T Black Hacked and other OSR RPGs to all backers. The setting has a more Saturday Morning Cartoons feel than C&T’s default grimdark setting of Zarth, and its sandbox nature means its the ideal accompaniment for C&T Black Hacked. Welcome to The Lost Lands of Grungamesh! Note, you won’t be able to get this bundle of zines at this crazy low price once they go on general release. 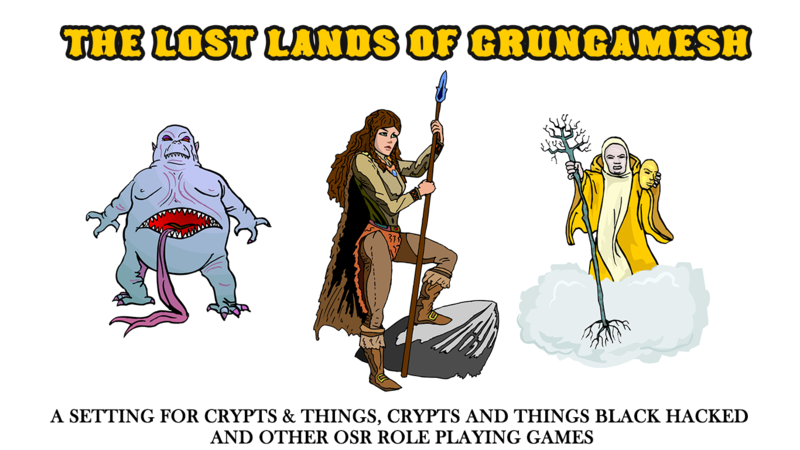 Crypts and Things Black Hacked and Lost Lands will be full priced individual items, and Intro the Shroud won’t even be available in print outside of this Kickstarter. If you’ve not backed you’ve got 5 days at the time of writing to do so. From the Shroud #2 ZineQuest Kickstarter. This issue takes the form of a 48 pages A5 black and white booklet, with black and white art by Jonny Gray (whose Death Rider graces the cover) and Dan Barker. My Dirty Little Secret. A quick table of dark secrets that player characters can have, and probably wish they hadn’t, at character generation. The Pie Makers of Peoplolis. An adventure location in the Zarth’s City of Beggars (although they may have a franchise near you). A Strange Thing Happened on the Way to the Ruins. An encounter table of weird and wonderful non-player characters to liven up otherwise dull and humdrum journeys. The Place of Dark Hooks. The old lair of a foul Court Torturer, whose riches and secrets are said to lie in its depths. A full Crypts and Things mini-module, usable with any early edition D&D game even, 5th Edition pretty much as written. All Hail the Death Riders. They are death from above with these flying undead warriors, a new monster for the game. Prince of Rona. A demonic Prince of an Other World, fit to become the character’s latest Nemesis. Varna’s Travelling Caravan. Neil Shaw details this group of travelling merchants who deal with the mysterious and harbour a dark secret. Also available if you missed it the first time around is issue 1, in pdf and print. Note both issues won’t be available in print after the KS via my normal outlets. Also, there’s a chance to get the main Crypts and Things rulebook and the released adventures at a deep discount as add-ons. Its been a while since issue 1, but issue 2 of the Crypts and Things fanzine, is nearly manifested in the world of flesh. My Dirty Little Secret – a quick table of dark secrets that player characters can have, and probably wish they hadn’t, at character generation. The Pie Makers of Peoplolis – an adventure location in the Zarth’s City of Beggars (although they may have a franchise near you). A Strange Thing Happened on the Way to the Ruins – an encounter table of weird and wonderful non-player characters to liven up otherwise dull and humdrum journeys. The Place of Dark Hooks – a full Crypts and Things mini-module. All Hail the Death Riders – they are death from above with these flying undead warriors, a new monster for the game. Prince of Rona – a demonic Prince of an Otherworld, fit to become the character’s latest Nemesis. Varna’s Travelling Caravan – Neil Shaw is back again with this group of travelling merchants who deal with the mysterious and harbour a dark secret. Clocking in at about 48 pages in A5 format (which is ten pages longer than issue 1) I’m looking to get it out by by early November, when I’ll be at Grogmeet in Manchester running The Lost City of the God-Emperor, which is part of the Under Dark Spires mega-module I’m currently finishing off for release early next year. 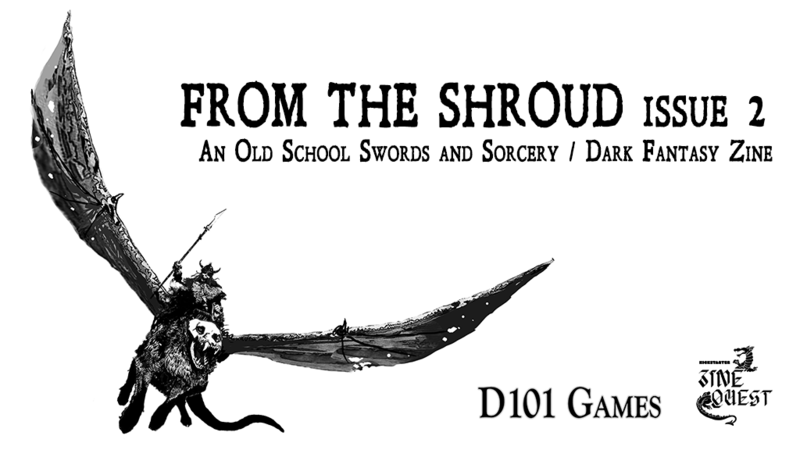 If you want to get a print copy, there will be a pre-order that runs for a couple of weeks while it is passing muster with the printer, via D101 Games’ Web store, during which time you’ll have instant access to the pdf. PDF only will go on sale via DriveThruRPG.com after the print pre-order. Here’s the cover for issue 2 by the talented Jonny Gray. 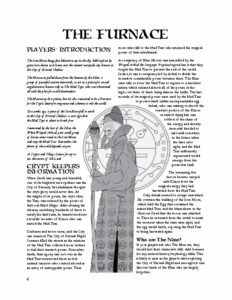 This the lastest Crypts and Things module, two convention/one-shot adventures and an article explaining how to run this type of adventure. 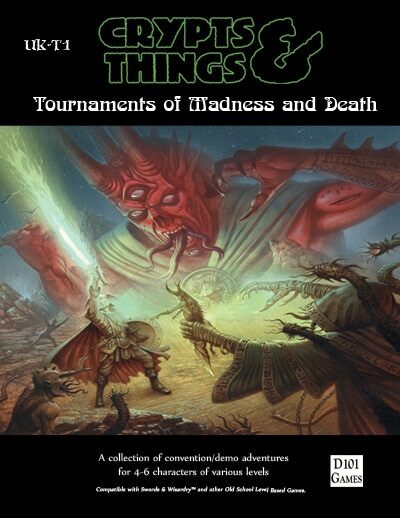 Crypts and Things is an OSR Swords and Sorcery game, with influences from the 80s British Fantasy RPGs (early White Dwarf, Fighting Fantasy etc). The module is easily usable with other OSR systems and modern D&D style games. Get the PDF immediately upon purchase and the print version in a couple of weeks when it clears proof with the printers. Please note: While the pre-order is running you can pick up the main rulebook in either soft or hardcover with £5/$6 knocked off the normal price. Free postage for UK residents on orders over £10. Tournaments of Madness and Death is done! Finally, Tournaments of Madness and Death is done! PDF versions to backers who got it as part of the C&T Kickstarter many moons ago, then I’ll be opening pre-orders via the D101 Games web store, later today. I’m so close to getting this one finished. Waiting for the last illustration and a quick layout check then it will be available for pre-order. 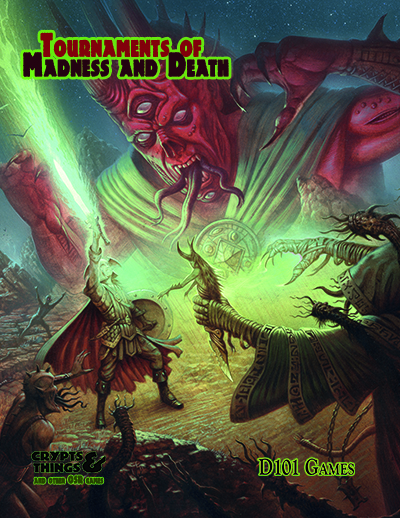 The next Crypts and Things release, Tournaments of Madness and Death, is currently in layout. I’m waiting on the last couple of pieces of art from Daniel Barker, who is doing a marvellous job of catching the Swords & Sorcery feel of the game, without being tedious and predictable. 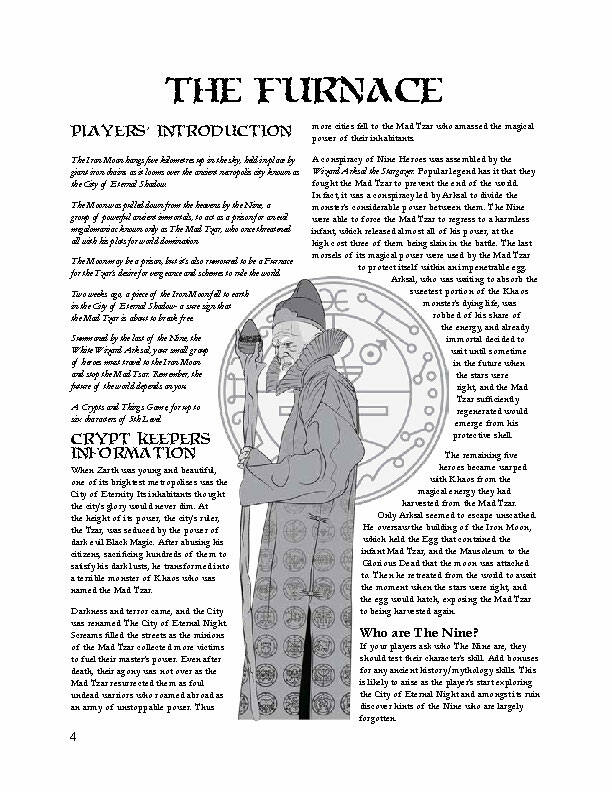 Here’s the introduction to The Furnace, the first of the two adventures in the book, which feature’s Dan’s illustration of the sorcerer Arksal. ETA Pre-order should open within the next week or so. with a general release mid-late August.